Adjust all the sophisticated functionality of your Roland V-1200HD switcher with the additional V-1200HDR Control Surface. 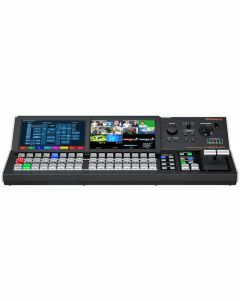 The V-1200HDR delivers a premium physical control surface for the V-1200HD with dual LCD touchscreens for monitoring and control, a sizable T-bar for effects and transitions, customisation and operation of the mix effects buses, HDMI video outs, and a plethora of buttons for source switching. Dual touch monitors display different GUIs on the left and right. Incoming video signals from the HDMI connectors on the rear panel can also be shown. Power Supply: AC Adaptor, DC 9 V to 16 V (XLR-4-32 type) * Can not be used at the same time. 20-1/2 (W) x 9-3/8 (D) x 4-3/8 (H) inches * Protruding parts not included.